Updates on wind generation technology, what’s happening with net metering, an outlook for natural gas, today’s advances in battery storage — these were just some of the topics covered in this year’s CREA Energy Innovations Summit October 26 in downtown Denver. The day-long program was packed with experts from all parts of the energy industry and a variety of viewpoints were presented to the more than 250 attendees. A highlight of the day was the lunch presentation by Dr. Donald Sadoway of Massachusetts Institute of Technology, who spoke on the liquid metal battery. Dr. Sadoway was excited about how this battery can help create storage that will allow the electric grid to further incorporate resources that are currently not dispatachable. The new liquid metal battery designed by his students at MIT and now being developed by Ambri is a grid-scale storage technology that can be used by a variety of participants in the electric industry. This new technology is flexible, able to respond in milliseconds to grid signals. It has little cycle-to-cycle capacity fade, which allows for an amazingly long life span. And it is emissions free, operates silently and has no moving parts, which also adds to its long lifespan. 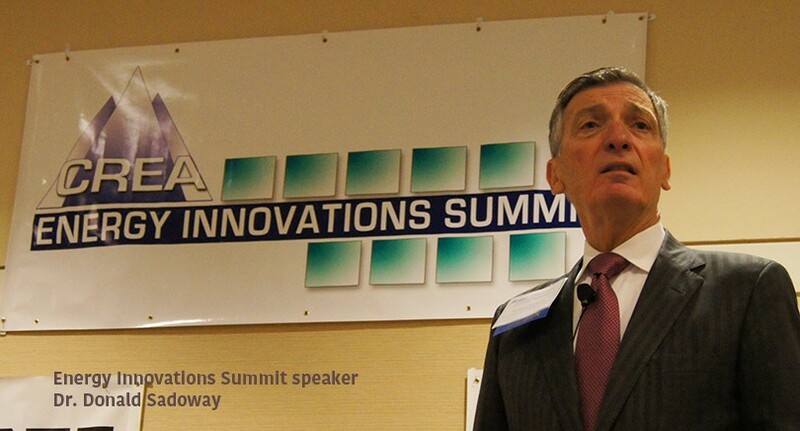 Read the Innovations newsletter for future reports on the Summit programs. And plan to attend next year’s Summit. Click the links below to listen to the audio files from the Summit. Some of these files take up to one minute before audio can be heard, so please be patient. Session 5 – Innovative Energy Efficiency Technologies – Ready for Prime Time or on the Horizon? Session 6 – Colorado’s Renewable Energy Policy – What’s Ahead?